I’ve been receiving a few questions on how to produce the AfterGlow diagrams from Cowrie logs, described in an earlier blog post. Instead of repeating myself through email requests, an explanation here will be better. First of all, you will need to decide what you want to visualize. 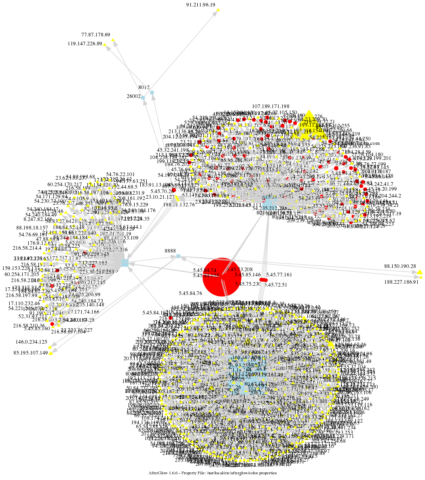 Showing the different attackers targeting a Cowrie honeypot has limited value (and can be visualized with something much simpler than AfterGlow). Showing the next steps of the intruders, however, is a job well suited for AfterGlow. The Perl code was saved as /usr/local/bin/cowrie2csv.pl on the host running Cowrie. Since I’m creating the graphs on a different server that where Cowrie is running, I wrote a bash wrapper to tie it all together. Note the quotes that separate what’s run locally and what’s run on the Cowrie server. Now, depending on the popularity of your honeypot, you may or may not get useful graphs. Below is a graph showing 24 hours of outbound connection attempts from my honeypot, in which case it could make sense to limit the input data.